Thanks so much for ordering my music. Before you go, there’s something very special I’d like to share with you. I’ve been singing most of my life, but it’s only recently that I’ve been able to make music that is truly my own, and I am famously proud of my EP ‘Factor This’. As you know, each song is a personal story, and the fourth song, Ordinary Girl, is about a very dear ex-girlfriend of mine. We met at salsa, and had a long, happy relationship. I was fortunate enough to make a video for that song, telling not only the story of our relationship, but also featuring an introduction depicting my horrible experience on X-Factor, where I was set up by the judges and producers, and how that inspired me to start writing my own songs in the first place. 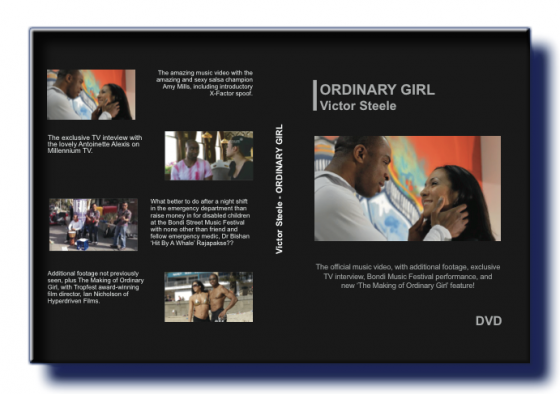 I am ecstatic with how the video turned out, and would like to offer the DVD as a bonus order. Included, as well as the full length video, is my interview on Millennium TV with the lovely Antoinette Alexis, and my performance at the Bondi Street Music Festival with none other than my good friend, fellow musician and emergency doctor, Bishan “Hit By A Whale” Rajapakse, as well as the making of the video. All this for the limited time only price of $35! Perhaps more importantly, by ordering the video, you’ll be helping to support the recording and release of future albums and tours. And just because I want to make certain everyone is happy with their purchase, I also offer a COMPLETE MONEY BACK GUARANTEE for 30 days. If the DVD is not what you expected for any reason, just send me an email within 30 days and you’ll receive a complete refund. Now I realize this is probably not for everyone. If my album was a gift, or perhaps just a casual purchase, than this special offer may not be for you. However if you are a fan of my music and would like to help support me as an artist while getting a great deal, then rest assured this is a great opportunity to acquire some very special content at a price that you WON’T see again. BUT PLEASE REMEMBER: This discount I’m offering on the above DVD is a ONE TIME OFFER. The DVD is not currently available anywhere else, and once you close this page this special price will be gone for good. So if you’d like to get access to footage of my singing, salsa dancing with National Salsa Champion, Amy Mills, interviews, live events, and lot more, click the order button you see below now! No thanks, I’d like to pass on this chance to order the DVD and proceed to the delivery of the music I have already purchased.